From a long time ago: [WayBack] Our CTO has discovered an incredible way of making developers read his commit messages. You won’t even believe how he did it! 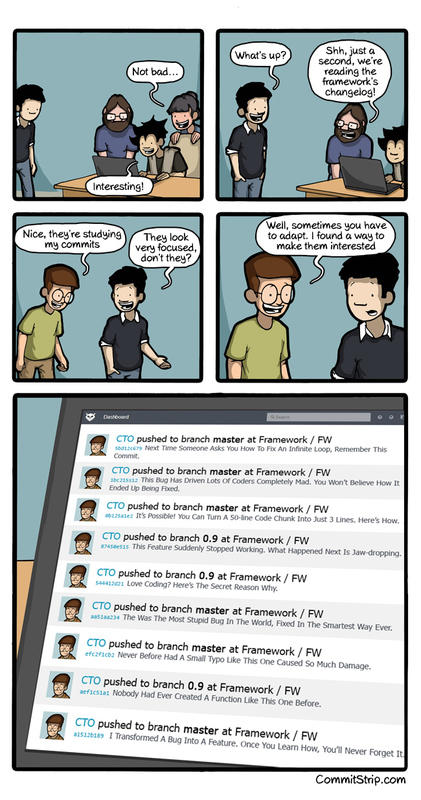 | CommitStrip. It seems others want to improve their commit Click-Through-Ratios as well, in a faint hope to get their pull-requests merged. This entry was posted on 2018/06/06 at 12:00	and is filed under Development, Fun, Software Development, Source Code Management. You can follow any responses to this entry through the RSS 2.0 feed. You can leave a response, or trackback from your own site.